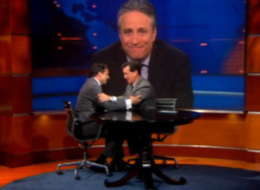 There was a time when Stewart was too sick to host the Daily Show and Colbert took his place. After Colbert's "sick" episode on Monday, I thought Carell's introduction on Wednesday's episode of the Colbert Report meant the same thing. Leave it to this creative team to come up with something even funnier and more surreal. The back-stabbing "compliments" in the Even Steven segment were some of the best ever written. Keep up the good work, boys.